Death-row inmate Celestine Egbunuche has been dubbed Nigeria's "oldest prisoner" amid a campaign calling for his release. He is 100 years old and has spent 18 years in jail after being found guilty of organising a murder. Small and slightly hunched over, he looks wistfully into space as he sits on a tightly packed bench inside a stuffy prison visitor's room. Dressed in a white T-shirt, shorts and flip-flops, he lifts his head slowly - his way of acknowledging our presence. But otherwise he remains quiet during our visit - in stark contrast to the rest of the room that is filled with loud chatter at Enugu Maximum Security Prison in south-east Nigeria. His son Paul Egbunuche, 41, sits protectively close to him - and does the talking. He is in jail on the same murder charge. Paul maintains their innocence. They were detained in June 2000 and eventually convicted and sentenced to death in 2014. It has not been possible to contact the family of the man who was killed - even the Nigeria prison service has been unable to find them. As prison officials look on, he tells me that his father isn't really able to talk much any more and is no longer aware of his surroundings. "When you ask him something, he says something else. The doctor told me that it is his age, he has become like a little pikin [child]. "There are some times when he will ask me: 'These people here [inmates], what are they doing here?'" Paul says he rarely leaves his father's side now; he has been his primary carer since his health began to deteriorate in prison. These health problems include diabetes and failing eyesight - and Paul uses what he can to manage them. "The only thing I'm using to manage him is food, unripe plantain, and they [officials] give him some drugs." Father and son share a cell with other death-row prisoners, who are separated from the general population. "When I wake up in the morning, I will boil water and bath him," Paul says. "I'll change his clothes then prepare food for him. If they open up [the cell] I'll take him out so the sun will touch him. "I'm always close to him, discussing with him and playing with him." Paul says the other inmates sometimes help him care for his father and that many of them want his father to be released. It was after his father's 100th birthday on 4 August that events were set in motion that may lead to his release. 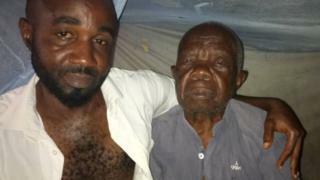 A photo of Paul and a frail looking Egbunuche went viral in August after a local paper did a story about him turning 100 in jail. It sparked a debate about the length of time Nigerians spend on death row and the place of capital punishment altogether. The latest figures from the Nigerian Prisons Service show that more than 2,000 people are on death row in Nigeria, many of whom spend years waiting to be executed. The death sentence is not commonly carried out in Nigeria. Between 2007 and 2017, there were seven executions - the last one taking place in 2016, Amnesty International reports. However, the death penalty is still meted out by judges for offences like treason, kidnapping and armed robbery. "You have people who have spent 30 years on death row, it's common," says Pamela Okoroigwe, a lawyer for the Legal Defence and Assistance Project (LEDAP). "Governors are reluctant to sign [death warrants] and they're not willing to grant pardons - that's why we have a high number of death-row inmates." Ms Okoroigwe says death row is a "punishment for the poor" and one that a growing number of Nigerians want abolished. "Have you ever seen a rich man on death row?" she asks. "How many people can afford to get a lawyer to represent them in court? A rich man who ended up in court can afford to get the best and he'll be free." This sentiment is shared by Franklin Ezeona, president of the Global Society for Anti-Corruption (GSAC), the non-governmental organisation that brought Egbunuche's case to the public and has been petitioning for his pardon. "If the man was the father of a governor or a minister, I don't think he would still be in prison," Mr Ezeona says. "Poverty in most of African countries hinders justice." He says it is unreasonable to keep people waiting for years on death row as "the trauma and the torture is too much". Mr Ezeona says that he hopes that Egbunuche's case will prompt the government to review other cases and shine a light on the justice system as a whole. "It will be good for the correctional system. It will show that with good behaviour, the government can give you a second chance." And Egbunuche may get a second chance as he has been recommended for a pardon by Imo state's attorney general, Miletus Nlemedim. It is now awaiting approval from Governor Rochas Okorocha. Mr Nlemedim says numerous factors are taken into consideration when an inmate is recommended for pardon - age, time served and the approval of the prison staff. The family of the victim has not been consulted about a possible release. "What we do as a government is to try to remove ourselves from sentiment," he says. According to Mr Nlemedim, the state's Ministry of Happiness offers the chance for reconciliation after a prisoner is released. In this case Mr Ezeona says it may be unlikely to happen given the length of time that has passed and poor record-keeping. Nonetheless, he is still confident Celestine Egbunuche will be pardoned. "If we can't pardon a centenarian, who can we pardon?" he says. Paul too is confident that his father will be pardoned - and is hopeful that he too will get a reprieve so he can care for him. "It's good for him to be released. So he will die peacefully in his house rather than in prison," he says.